Go with me on a journey back in time, won’t you? Back to a time when you didn’t know what IEP, IFSP, PLEP, PLOD, LRE, CD, SLI, ID, ED, SLD, or any other special education acronym meant. When you sat down at your first SpEd team meeting and looked around and wondered, “Who are all of these people?” When you think about that time, what do remember feeling? Bewilderment? Befuddlement? Maybe even a little embarrassment? Thankfully, I’ve learned a little bit in the (many) years since those first foggy meetings. I know all of the jargon, all of the procedures, all of the people. I’m almost never utterly confused anymore. But every time I am part of a referral, eligibility, or move-in meeting, it all comes rushing back. The sheer overwhelmingness of it all is writ large on the faces of the caregivers I work with, and I often find myself wishing I had something to give them that might help. I now offer you proof that wishes really do come true. 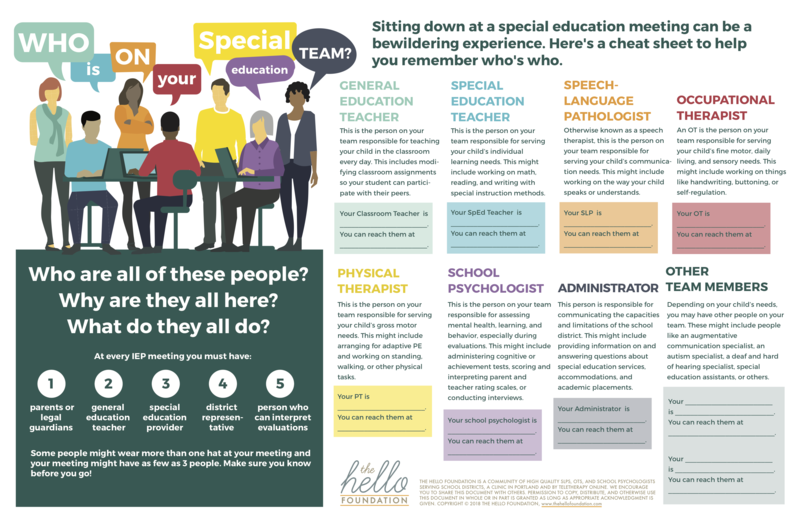 Meet our latest printable, Who Is On Your Special Education Team? This pdf was designed to be printed and shared with caregivers at any stage in the special education process and offers information about who is required to be at an IEP meeting as well as job descriptions of the significant players. My favorite part is the space provided to write down the name and contact information for each of these people. We’ve provided this download in 3 different sizes (2-page letter, 1-page tabloid, and 1-page legal). Click on the link below to select the size you’d like to download and let us know what you think. We hope it makes the sped process a little less daunting for you and the families you serve.